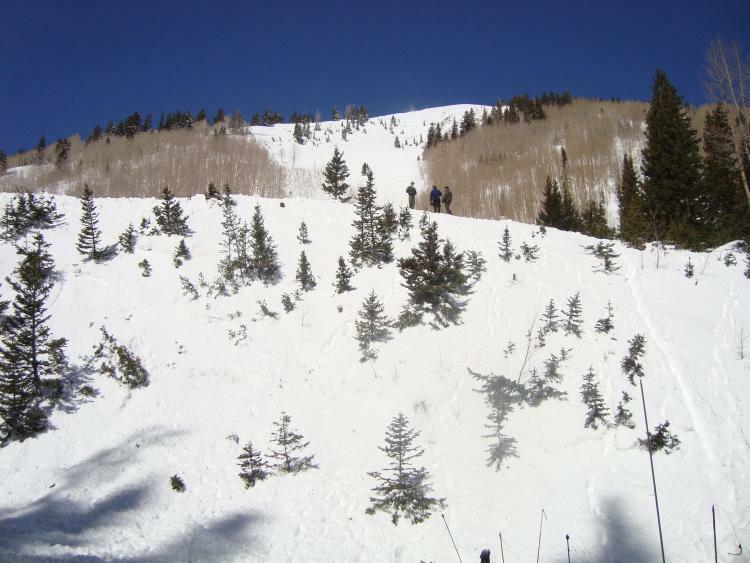 A group of 4 individuals from the Norwood, Colorado area decided to go on a snowmobile tour from Gateway, Colorado and up into Beaver Basin in the La Sal Mountains, Utah. They started in the early morning. It was the first time to Beaver Basin of the season for the group leader, who had been there twice before. Another member of the party snowmobiled in the area once before. On their way to Beaver Basin, the party did not notice any signs of instability. Once in the basin proper, snow conditions were getting deeper and on numerous occasions, the more experience riders needed to circle back around to assist the less experienced digging their snowmobiles out. The summer road did not have any noticeable snowmobile tracks, as they continued up the group leader realized that they were entering a land of diminishing returns...the amount of stuck snowmobiles and tough going warranted the party to turn around. But where? The first sign of instability the party encountered were roller balls off a cliff band (avalanche terrain) less that 1/8 a mile from the accident site. The summer road in that area was too steep to stop (they did not want to get stuck) to regroup and the group leader remembered a meadow that could work as turn around point and regrouping area. Unfortunately, this meadow was where the accident occurred. 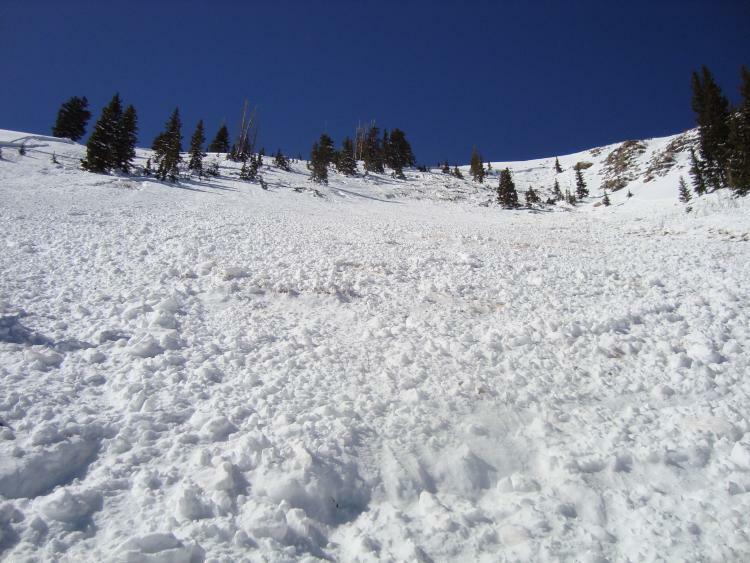 The summer road into Beaver Basin is affected by numerous avalanche paths, and this clearing was a result of the classic avalanche path looming above. The first two snowmobiles crossed the avalanche path and regrouped on the other side in the more protected part of the meadow. As the third snowmobile made its way across, the first two started to see "snow dust" coming down the avalanche path and waved the third on. As the third made it to the first two, the fourth snowmobile (victim) crested over the top of the steep hill and into the avalanche path. Vigorously waving for him to cross, the "snow dust" turned into a powder cloud and then debris and powder cloud obscured their vision for over 30 seconds. Once the snow settled, the fourth snowmobile and his rider was nowhere to be seen. The party started to search for their partner immediately. Unfortunately, the party only had one beacon, one probe and two shovels. 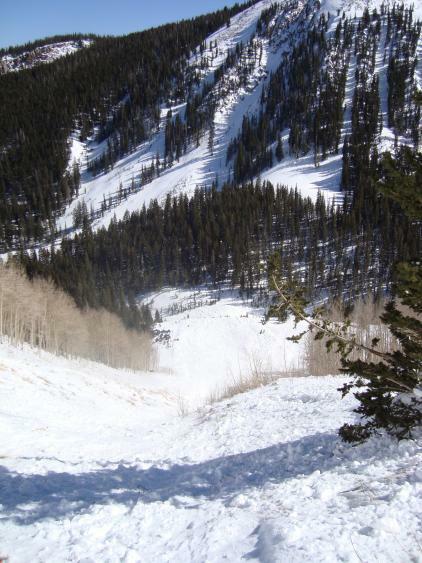 They started their search from the last seen point and realized the force of the avalanche pushed the victim off the bench the summer road was on and into a classic terrain trap: a steep gully. They had a very good feeling where he was buried: probed all over the place, yet their probe could not reach the bottom of the debris (which in some places was over 30' deep). There was a potential probe strike: the party dug a six foot hole in this location...they were losing time. Approximately 1 hr 45 min elapsed during this search and the party realized they were outmatched to find their companion. They left and found cell service way down John Brown's Canyon on the way to Gateway. The accident occurred around 10:30 am and Grand County Search and Rescue received the call on 2:00 pm. On Saturday afternoon, a hasty team of Grand County Winter Search and Rescue members were flown in to the site. The hasty team probed in likely areas along the bench and in the ravine. Once likely burial areas were probed, a coarse probe search started from the last scene point downhill while one of the hasty members continued to probe likely areas in the ravine. On a hunch (and a bit of luck) the spot probe decided to probe the bottom of the hole already dug by the snowmobile party. It was determined a positive strike was made. All efforts then were diverted to determining the probe strike. Upon digging to the end of the probe utilizing the conveyor method, the cowling of the snowmobile was uncovered. No other actions could be done at this time due to darkness and the victim was not positively found. On Sunday morning, March 4th, a large group of Mesa County and Grand County Search and Rescue team members arrived on scene shortly after 10:00 am. Over 50 rescuers contributed their time and effort in the search. 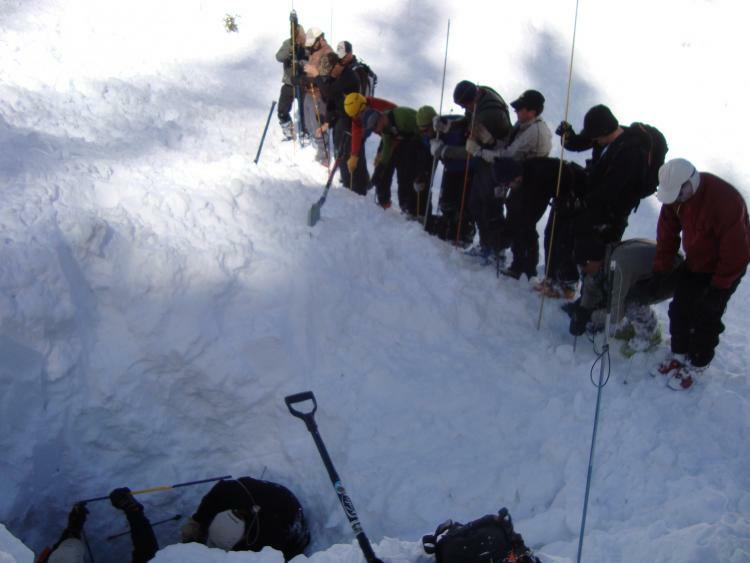 In the beginning of the search, one team probed the entire slide path along the bench below the last scene point while the second group started to move a metric ton of avalanche debris below. 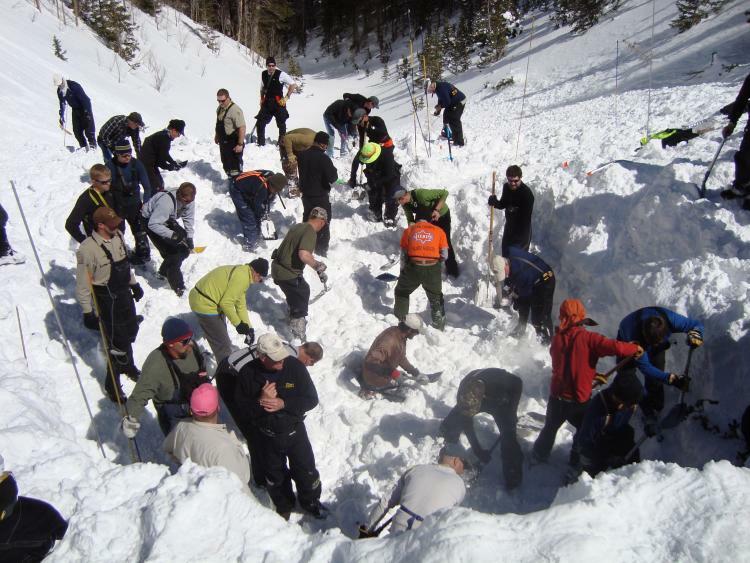 Once the upper area was cleared, all rescue team members contributed to digging out the victim and his snowmobile. By noon, the victim was identified and by 1300 was removed from the accident site. 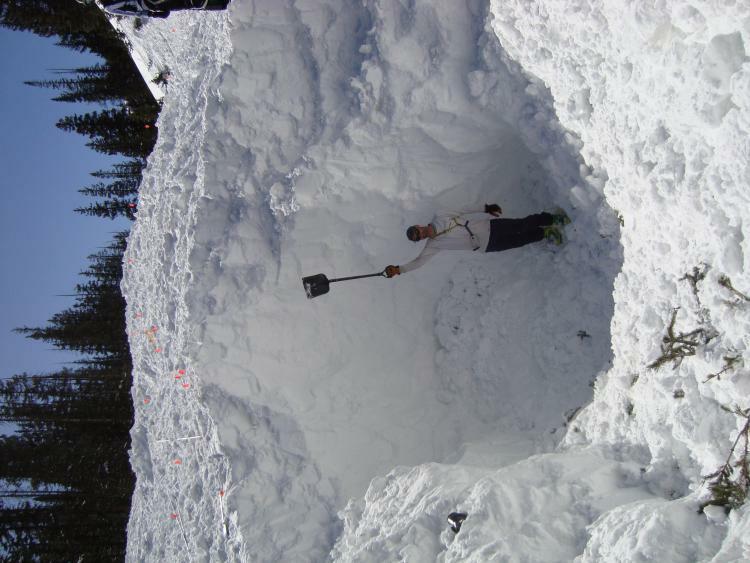 He was found approximately 3 feet uphill from his snowmobile and under at least 12' of avalanche debris. Our thoughts go out to the friends and family affected by this tragic accident.